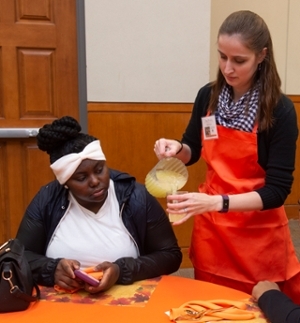 In the spirit of the holiday, Southern Illinois University Edwardsville East St. Louis Charter High School (CHS) continued its tradition of turkey, thankfulness and togetherness during its fifth annual Thanksgiving Day Meal Celebration. 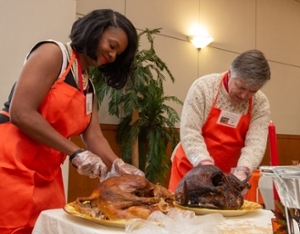 Carving up the turkeys are SIUE East St. Louis Charter High School Director Gina Jeffries and SIUE Chancellor Randy Pembrook. 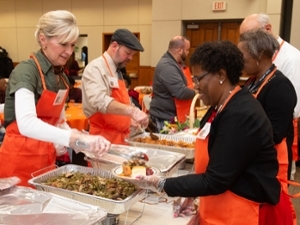 Some of those on the serving line included (L-R) Kim Durr, CHS board member and SIUE chief of staff, and Colin Neumeyer, CHS English teacher. Durr adds green beans to a plate held by Edith Laktzian, CHS resource teacher. CHS teacher Anna Turner makes the rounds and pours student Betty Nichols a glass of lemonade. 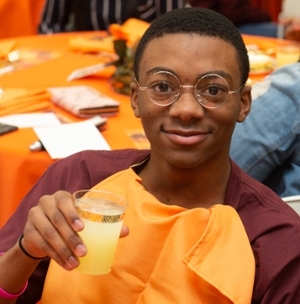 CHS student Jalen Paraham toasts to another fun and fulfilling Thanksgiving Day Meal Celebration.